First off, thank you for a great kit. My wife got me the Cajon kit in September and I've been having a blast playing it. 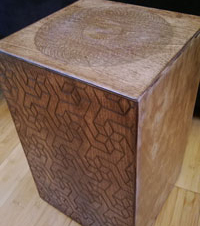 I used a laser engraver to decorate the Cajon, and it turned out very well. The top is a spiral pattern, the sides are interlocking geometric squares, and the front detail is "Sky and Water" by M.C. Escher. 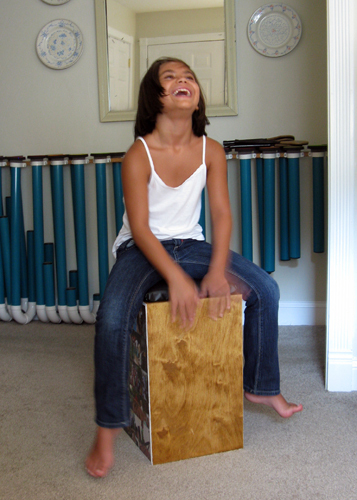 I thought you might like to see my cajon, made from your kit. I teach children to play the hammered dulcimer (and many other instruments!). My group of young dulcimer students is called *Hammerkidz By the Bay*. 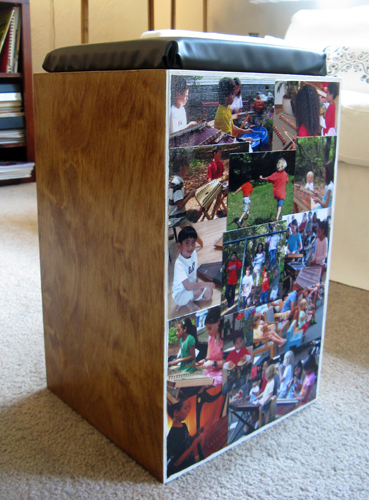 They will be playing the cajon in jam sessions and performances, so I decoupaged the sides with photos of them. It's a hit!